A baby who was born with her large intestine outside her body defied the odds to survive and is set to celebrate her first birthday. Lily-Rae Lawrence's parents Melissa Thompson, 32, and Richard Lawrence, 34, first realised something was wrong when their 12-week scan revealed a 'puff of smoke' coming from their daughter's abdomen. The youngster was born with the birth defect gastroschisis, which occurs when the bowels exit the body via a hole near the belly button. Her small intestine was still inside of her. Doctors feared a build-up of pressure in the colon, caused by the passageways narrowing, would make the large intestine rupture and could be fatal. 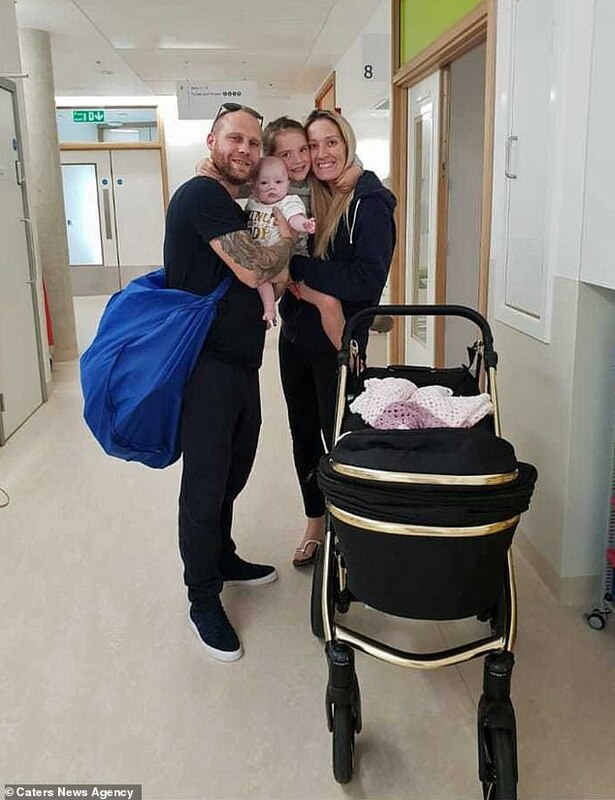 Lily-Rae - who endured her first operation at just four hours old - went under the knife three times and spent five months in hospital. The youngster, of Sheffield, was finally discharged last September and is set to celebrate turning one on Thursday. Speaking of his daughter's condition, Mr Lawrence, who is also father to five-year-old Ruby, said: 'The stomach was flat on the scan, but we could see something in the picture outside of her belly, her bowels were on the outside. 'It looked like a puff of smoke outside her belly, our initial thoughts were pure worry, you get yourself in a panic trying to get your head around it. Lily-Rae was born at 36 weeks weighing 6lbs 2oz. Her parents immediately saw something was seriously wrong. She was found to have gastroschisis, a defect caused by the abdominal muscles not joining properly before a baby is born. Most babies are not seriously harmed by the condition and, after a stay in intensive care, will recover. But between 10 and 20 per cent will suffer significant damage which can complicate the birth and occasionally cause the baby to die, according to Benioff Children's Hospital in California. 'It was just heartbreaking,' Ms Thompson said. Doctors planned to reinsert Lily-Rae's bowels after initially wrapping them in a cling film-like material in a plastic bag. They hoped gravity would help place her colon back into its correct position several days later. 'But it was not a normal case, it was very complicated and required more surgery,' Mr Lawrence - an electrical engineer - said. Of the 30cm of colon outside of Lily-Rae's body, only 17cm was 'alive'. Doctors were forced to cut away the dead tissue and create two stomas to divert faeces out of her little body. They hoped her remaining bowel tissue would survive on the blood vessels she had and then grow. The doctors also worried Lily-Rae may have short bowel syndrome, which affects a person's ability to absorb nutrients, fat and calories via their small intestine. 'This could have meant she would have been on a drip for up to as much as 21 hours a day and could have even spent a number of years in hospital,' Mr Lawrence said. TPN is a way of supplying the nutrition a body needs by bypassing the digestive system and dripping a vitamin-rich solution directly into a vein. But things started to look up after Lily-Rae's third operation, which investigated whether her small and large intestines had untangled. Lily-Rae was discharged after 149 days in hospital and has gone on to be a healthy baby. 'Everything that was thrown at her she came through fighting, she's made a perfect recovery with no concerns,' Mr Lawrence said. Ms Thompson added: 'Some of those days in hospital were some of the worst of our lives and felt like the longest five months, it was heartbreaking watching her go through all of that.